About a year ago, Minnesota Gov. Jesse Ventura traveled to Cuba to promote the state's trade interests. 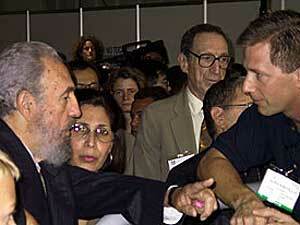 He was taking advantage of the U.S. government's partial lifting of the Cuban trade embargo. Since then, U.S. exports to the communist country have skyrocketed. Minnesota is among the top 10 states that export to Cuba. However, Minnesota farmers are concerned about how heightened U.S.-Cuba political tensions will affect their exports. St. Charles, Minn. — St. Charles farmer Ralph Kaehler says doing business with Cuba is a lesson in working with paranoid, controlling bureaucrats who require loads of unnecessary paperwork at frequent stages of the deal. And he's not talking about Cuba's communist government. "The difficult part, has been for the most part working with our government -- getting visas for Cuban livestock inspectors and veterinarians to come up and inspect the animals, like every other country does. That took forever. It's just fighting the politics side of doing business," says Kaehler. A year ago, American political and business interests towards Cuba were joined at the hip. They were taking advantage of Congress's partial lifting of the 42-year-old trade embargo. This cleared the way for agricultural and food product exports to the country. Harming lawful business activity isn't the way to harm the Cuban government. What you're doing is harming the business community. And is that really your target? Then Cuban President Fidel Castro imprisoned more than 70 political dissidents. He also ordered the execution of three Cubans trying to escape the country this past spring. The move spurred President Bush to publicly condemn Cuba two weeks ago, promising further travel restrictions. Though goods are still flowing from the U.S. to Cuba, farmers like Ralph Kaehler wonder how long it'll be before politics get in the way. Four black heifers eagerly line up at a trough as Kaehler turns on the water. "Their offspring will be the ones that go to Cuba in the next couple of years," he announces proudly. Kaehler and his young sons, Seth and Cliff, became celebrities for a day last year during Gov. Ventura's trade mission to Cuba. Fidel Castro posed for pictures with them and their bull for the international press corps. Since then, Kaehler has sold some of his own cattle to Cuba. He's also been back to the country, trying to sell an ethanol byproduct. Castro hosted him on that trip, too. He says the revolutionary leader has again asked to meet with him when Kaehler returns to the country next week. "He's got an incredible presence about him," Kaehler says of Castro. "He's very intense about his things, and knowledgeable about a lot of issues on it. Very dominating in conversation. He can go on and on and on." The relationship between Kaehler and Castro is amicable enough that Kaehler's family is now on the Cuban leader's holiday card list. A New Year's card signed by Castro is displayed in the farmer's kitchen. Up until this year, this chummy relationship has exemplified U.S. trade to Cuba. Figures vary, but according to the U.S.-Cuba Trade and Economic Council, exports to Cuba since 2001 total more than $260 million. Officials from the U.S. Department of Agriculture say this figure could be as much as $500 million. Last year, the U.S. provided more than 20 percent of Cuba's agricultural products. This year, experts expect this to increase to around 40 percent. "In 2002, the relationship from a commercial standpoint was leaping from one peak to the next," says John Kavulich, president of the New York-based U.S.-Cuba Trade and Economic Council. "Every month there were new purchases, U.S. companies were sending representatives down. Members of the House and Senate were going down. Governors were going down. There was a lot of euphoria." The high point was last year's U.S. Food and Agribusiness exhibition in Havana, which was attended by a large delegation from Minnesota. The event garnered more than $92 million in sales for U.S. businesses. "The Cuban government said, 'Well, we want to buy from everybody.' And they just kept going, and going, and going, like the proverbial Energizer Bunny. It was great for U.S. companies," says Kavulich. A second exhibition was planned for January 2004, but it was cancelled after the U.S. Treasury Department refused to grant the necessary permits to the exhibitors. The Bush administration is also clamping down on non-business visits by U.S. schools and non-profit groups, whose most current licenses are expected to expire by the end of the year. Kavulich says the success of last year's exhibition should serve as an example to the president of why further restrictions to Cuba aren't a good idea. "Harming lawful business activity isn't the way to harm the Cuban government," says Kavulich. "What you're doing is harming the business community. and is that really your target?" U.S. Sen. Norm Coleman, R-Minn., says the target is Cuba's human rights record. He isn't alone. Since Castro's crackdown last spring, members of Congress who supported easing trade and travel barriers dropped by 13 percent. Last year, while campaigning for Senate, Coleman told voters he supported easing trade and travel restrictions on Cuba. Last month, Cuban officials warmly welcomed Coleman when he arrived for an official visit. However, their mood changed early in the trip after he met with relatives of imprisoned poets, artists, and journalists. "And the next thing I know, the anticipated visit with Castro never took place," says Coleman. "On the way out of the country -- my plane got there at 8:15 and I wasn't told it was there. We waited for another hour in order for a flight plan to be approved. I went from a welcome guest to, perhaps, being unwelcome, because I simply reflected the concern of folks who are languishing in jail." Coleman says once Castro starts releasing these prisoners, he will go back to advocating for fewer restrictions on the country. But for farmer Ralph Kaehler, that isn't enough. Back on his farm in St. Charles, Kaehler says Coleman is helping undermine the success of the Ventura trade mission. "I look at people that deal with me. If they came and visited me and then started complaining about me, I probably wouldn't be too fired up about them," says Kaehler. Kaehler says Coleman is playing party politics. "It would make sense to me, when you're elected in Minnesota, that you check and see what's best for your constituents," says Kaehler. "Go with that first, and then go to your national party and say, 'You know what? I can understand where you're going with that, but here's what my people that elected me need.'" Kaehler says he wonders why members of Congress aren't applying equal pressure to countries like China or Saudi Arabia. Both are U.S. trading partners whose governments have also been criticized for their human rights records. According to Cuba trade expert John Kavulich, these countries are too important to American business interests for the U.S. government to apply the same principles. "The government of China made it very clear to U.S. companies -- You support us, or we may have difficulty dealing with you. And that resonates with U.S. company executives. In the case of Cuba, it simply isn't as important, economically, yet," says Kavulich. Kavulich says Cuba's proximity to the U.S. and its enthusiasm for American products give the country the potential to be an important trading partner. That is, he says, if politics would just get out of the way.